Bad memories, I welcome you nevertheless, you are my distant youth. If you are really interested in the topic of French Resistance there is no escaping this movie. If you are truly interested in film there is no escaping this movie either. Especially not since there has been a recent wave of Resistance movies (Les femmes de l´ombre (Female Agents), L´armée du Crime ( The Army of Crime), Flame and Citron, Black Book, Winter in Wartime, Max Manus) and it is always good to see where they come from, what influences they had. 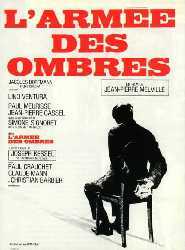 Jean-Pierre Melvilles´s L´armée des ombres aka The Army of Shadows (or in the Shadows) is a classic and a work of art. Gerbier (Lino Ventura) is captured by the Gestapo early in the movie. He manages to escape but knows he has been betrayed. Only one of his own could have told the Gestapo where this overly careful man was hiding. Gerbier is head of a Resistance cell that operates between Paris, London, Lyon and Marseille. They always on the look out for people they can trust. They must always be careful, they could be betrayed anytime. They are hunted and on the run continuously. When they are caught by the Germans or the collaborators, they will be tortured mercilessly as the film shows drastically. But the group will risk everything to save one of their own. The cell kills traitors as well as people who become too risky. No matter how much they helped them in the past, no matter how much they like them. The group ultimately lives and dies for the cause. Lino Ventura and Simone Signoret are fabulous in this movie. It is a pleasure to watch such assured actors. A feeling of abandonment and utter loneliness pervades the whole film. It seems to illustrate the existentialist angst of the times. Melancholy in its purest form. What impressed me most was the sound. No effects like we know them nowadays but so artfully and sparingly used noises and sounds and just a little bit of music. The rain in the beginning, echoing footsteps in empty streets, the ticking of a pendulum in a room, the distant cry of birds. It is quite a sad movie and I would not recommend you watch it should you feel very blue. It would not cheer you up. But on days when you feel balanced enough you will admire these brave people and suffer with them when they find out one of them is being tortured but won´t speak, not even when he knows he is going to die. And, please remember, this is a true story. This entry was posted in French, Movie, Resistance, Trailer, War Movie, WWII and tagged French Resistance, Jean-Pierre Melville, L´armée des ombres, Lino Ventura, Movie Trailer, Movies, Resistance, Shutter Island, Simone Signoret, The Army of Shadows, War Movies, WWII.